Filet of beef with twice-baked potatoes is no longer the standard at weddings. Today, couples are opting for more distinctive flavors, whether from around the world (Chinese dim sum, Italian grilled panini, or Spanish tapas), from a particular part of the country (Southwestern or Cajun cuisine), or from their own families' kitchens. With so many options, choosing the menu for your wedding dinner is more complicated -- and more exciting -- than ever. Here, some advice for planning the most memorable dinner party of your life. The wedding menu can take many forms, from a simple self-service buffet to an elaborate five course meal served by waiters. In the most traditional version, a seated dinner is generally preceded by a cocktail hour with hors d'oeuvres and contains three courses: a first course, a main entree, and a dessert. The first course is typically a small, composed plate -- an artfully arranged salad of oranges, fennel, and olives, or a trio of prawns with a garlicky aioli, for example. The main entree usually includes a meat or fish, such as filet mignon or poached salmon (you should have a separate dish for your vegetarian guests), accompanied by a starch (herbed rice, mashed potatoes with truffle oil) and a vegetable (glazed carrots, grilled eggplant). Dessert may or may not be your wedding cake; some couples serve a separate dessert -- something light and refreshing, like a lemon tart -- and save the wedding cake for later in the reception, say, during the dancing. You can offer guests a choice of entrees; doing so can be more expensive but your caterer doesn't need to have two of everything -- he or she should know from experience which dishes are more popular. If you do offer choices, guests can make their selections from menu cards or servers can describe the entrees; you needn't solicit guests' choices in advance on the invitation's reply card. Before you decide on a menu, you need to choose a caterer. Try to book one as soon as you pinpoint a date; the best caterers are often reserved a year in advance, especially for popular times in June. Be aware that some reception sites have exclusive catering arrangements, so you may be required to choose from a proscribed list of vendors. While you and your caterer will certainly begin discussing menu ideas early on, you generally have until much later to finalize the menu. Many caterers don't need to know exactly what you'll be serving until two weeks before the wedding. Of course, for your own peace of mind (and if you're having menu cards printed up), you'll want to make your decisions sooner than that. If you feel at all uncertain about your caterer's recommendations, request a tasting. Most caterers will offer at least one tasting for free after you've signed a contract and have a rough idea of what the menu will be. "Some of the best weddings I've done have started with the couple's stream-of-consciousness list of likes and dislikes," says Peter Callahan, owner of Callahan Catering in New York City. Begin by thinking about what you love to eat. Think too about any foods that have special significance. Your wedding is an opportunity to share something intimate with your guests -- your combined culinary heritage (reflected in an Irish-Indian buffet, perhaps) or the fact that you had your first date over Korean barbecue. Just remember that your guests' culinary tastes might not be as adventurous as your own. If your family and friends have conservative palates, you may want to limit the more exotic foods to hors d'oeuvres. (Also, if there will be lots of children at your wedding, you might devise a separate menu of kid-friendly foods, like pasta or individual pizzas.) Cookbooks, magazines, even restaurant menus can provide additional ideas. Your caterer will also offer suggestions, and he or she should help you choose flavors that go well together. 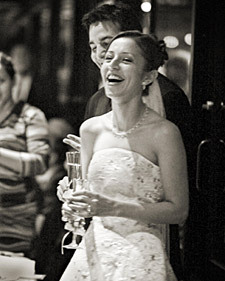 Christine and Peter Barrett were so inspired by a molten chocolate cake at a restaurant in Vermont that they decided to hold their wedding there in June 2003. They worked closely with the chef to compose a menu that was memorable as well as realistic for the small kitchen to pull off. Guests were treated to a cold tomato soup, filet of salmon, sauteed squash, and roasted potatoes; dessert was the chocolate cake, of course. If you choose your favorite restaurant to create the menu, keep in mind that you may not be able to pick from their normal fare; many thew Freedman married in northern California in July 2003, they wanted to give their out-of-town guests a taste of the regional cuisine. Their catered buffet dinner, held at Alana's parents' home, featured locally grown heirloom tomatoes and artichokes and wild salmon. The menu also had a nonlocal but equally personal dimension: Alana's uncle flew in pints of the bride's favorite ice cream from Cincinnati, where she had spent her high-school years. Mary Giuliani, director of special events of DM Cuisine, a catering company in New York City, advises couples to also consider the location and the time of the year. A site that's designed for big events, such as a hotel ballroom or a banquet hall, has the facilities and staff to serve any food in almost any style. A wedding held on a beach, on the other hand, has its limitations -- but it's also an opportunity to do something unique. Most caterers can build a kitchen just about anywhere; they can rent burners, ovens, tables, even refrigerators, and hook them up to a generator if necessary. This is, indeed, an expensive proposition. But food that's prepared simply -- cold soups, roasted chicken, couscous, and green salads -- is easier to serve at a beach wedding and is naturally fitting for summer. A couple marrying on a snowy night in December might opt for comforting dishes such as rack of lamb and pureed parsnips with butter. Many caterers these days are cooking with a greater focus on seasonal foods; a good cook knows what grows when and where, and should be able to direct you in creating a menu that highlights the best of the season. This is a common option for weddings, offering food in courses presented on individual plates. It's a great way to serve classic cuisine, as there's generally less variety than with other types of service. The cost, however, is usually higher than that of a buffet or family-style dinner. A caterer might require as many as ten cooks and three times as many servers to prepare and serve two hundred plates of poached salmon. Also, there are rental costs to consider; each course comes on a different plate and uses a different utensil, which can add up. This is a more refined version of plate service. The dinner still comes in courses, but it is not brought to the table on individual plates; instead, each course is arranged on a large serving dish and carried to each guest at the table. In the most traditional form of French service, the guests serve themselves from the platter with tongs or a fork and spoon, but at most weddings, the waiter dishes out the food. This type of service doesn't require as much help in the kitchen because there are fewer plates to put together, but you will need nearly as many servers. A buffet is a good choice for both finicky eaters and a crowd that loves to eat. It can include many different dishes and nearly any style of cuisine. Guests can serve themselves (choose foods that hold up well over a heat source or at room temperature), or you can have servers offer items that are carved, like roast turkey, or prepared to order, like omelets or a pasta. Though it requires a smaller staff, the cost of a buffet can sometimes be as great as that for plate or French service since the caterer makes more food and may need more rental equipment, such as chafing dishes. For the couple who can't decide on just one or two types of cuisine, stations are a good solution. A station is a buffet table featuring a particular type of food. A station reception should have four or five tables. Each may offer a different course or style of cooking: Japanese noodles, Italian antipasto, Middle Eastern mezes. On-the-spot cooking, like grilling, is always interesting; guests can even get in on the action, assembling tacos or mixing seviches. Coordinating stations can be complicated, and with so many options, food and rental costs can be high. Another option is to set the food out on each dinner table on big platters and let guests serve themselves, family style. "Pass the potatoes, please" is such a familiar and warm request that it's sure to make easy acquaintances of strangers. While this is a more casual type of service, the food can be as decadent as you like. It need only hold up over time, which means dishes that taste good at room temperature. Caterer Peter Callahan likes comfort foods for family-style meals -- braised ribs, creamy risottos, and luscious salads of baby greens, soft cheeses, and nuts. Less staff is needed, so family style is usually the most economical choice. The cost of a wedding dinner has two main components -- the price of the food, and the price of serving it, which includes rentals, staff, service charges, and gratuities. A caterer's bill generally lumps these two factors together in one per person price, but it can be helpful to think of them separately when planning your budget. If lobster is your heart's desire, but doesn't fit within your budget, ask your caterer to serve it in smaller portions as an hors d'oeuvre or appetizer. Alternatively, if your menu includes expensive foods, choose a more economical style of service -- a big, steaming platter of lobster offered family style is just as tantalizing as a lobster tail that arrives on each guest's plate, and the cost of serving it is much lower. Luxurious foods are not limited to filet mignon and truffles. Callahan suggests a first course of risotto with mushrooms, and a second of braised spareribs, which use less expensive ingredients but are just as exquisite. One of his clients served fried chicken at a very elegant sit-down dinner, simply because she liked it. Wedding etiquette dictates only that you throw a gracious and thoughtful party, not that you offer caviar and French Champagne. The most important goal of any wedding is that it express the couple's taste.